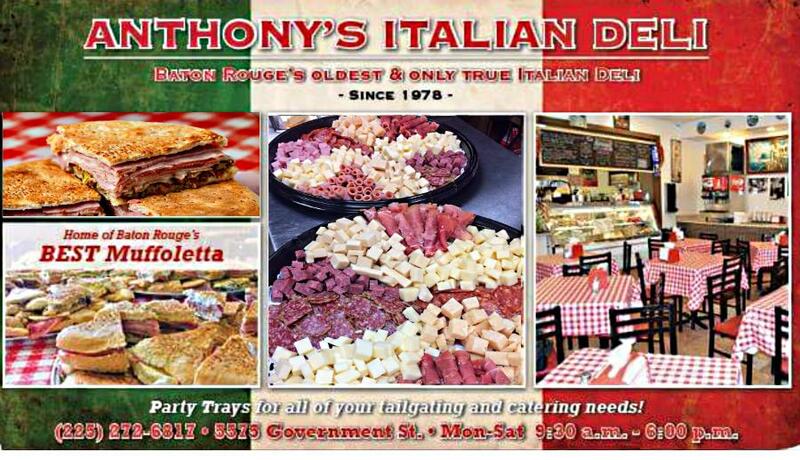 Anthony’s Italian Deli was founded in 1978 by Anthony and Marie Saia. Anthony was born in Sicily, Marie in Bergamo, north of Milan, and they settled in the United States over fifty years ago after they married. Anthony now leaves the management and daily operations to his family. Marie and their two children, Marco and Margaret, continue to operate the same way as when they first opened. The deli still serves nearly the identical menu, the original hangs near a picture of the Pope. They feature their famous muffolettas, pressed sandwiches, and homemade spaghetti with house-made sausage. Anthony’s olive salad is their homemade secret recipe. Meats are sourced locally when possible and cheeses are imported from Italy. Their muffoletta bread is made by a local baker that was taught how to do it by the Saia family. The décor of the dining area is a remembrance of the ‘Old Country’ with red, white, and green striped flags, family photos, maps of Italy, every table has the same classic red and white checkered tablecloths; and shelves of imported Italian foods are stacked along the walls.